Meisterstück Atelier is a new ultraluxe “connoisseur” range of Montblanc Meisterstück fine leather goods - a high end, top-tier line of men’s accessories which are finely crafted from the rarest and most precious materials in the world. The launch of the first two Meisterstück Atelier collections - Meisterstück Atelier Genuine Python in October 2010 and Meisterstück Atelier Genuine Karung in April 2011 - marks the first time Montblanc men’s leather goods have been conceived from the prized snakeskins after which these two lines derive their name and the choice of such exotic materials is apt. 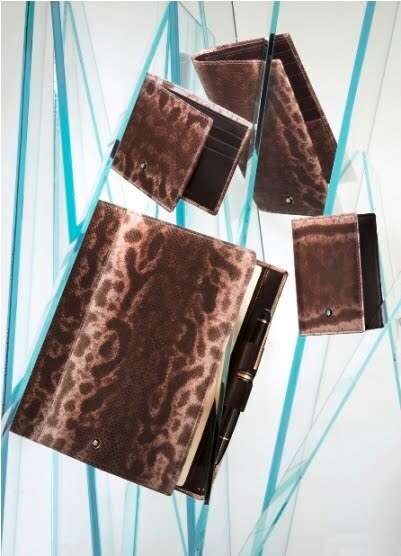 Graphic snakeskin print projects a powerful, masculine allure. 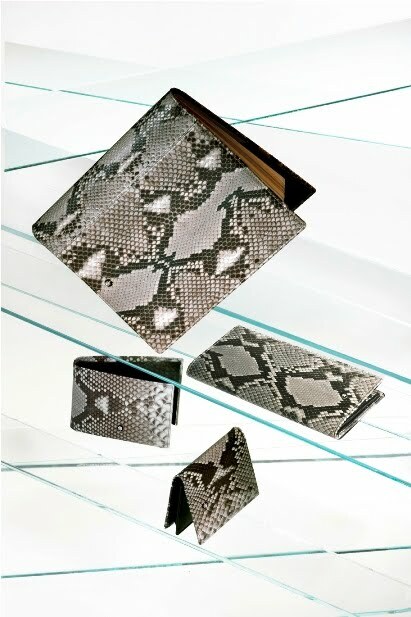 And while python is an eternal symbol of ultra-luxury, karung, a water snake-skin, has lately become sought-after due to the distinctive beauty of its mottled markings as well as for its exceptionally soft texture. The “first touch” of a Montblanc leather accessory is also uniquely renowned to evoke, at once, its careful tanning, robustness and workmanship. The Meisterstück Atelier collections are no exception because the feeling of python and karung both convey an inimitable richness as well as a cool, silky-smooth sumptuousness. Montblanc Meisterstück leather goods are modern interpretations of the world-renowned design of Meisterstück writing instruments. Thus each one is produced to conjure the meaning of its namesake and therefore be a meticulously handcrafted “masterpiece” as well as an enduring investment classic to be handed down from generation to generation, just like the original Meisterstück fountain pen. So the exquisite Meisterstück Atelier collections have been masterly crafted at Montblanc’s luxury accessories workshop in Florence by artisans highly skilled at manipulating rare skins with traditional techniques. Each stitch and every fold executed in production has been exacting and purposefully applied to render a sharp, timeless look just as the python and karung appear undyed so as to display the “genuine” pure beauty resonating from their original, vivid patterns, the natural earth toned skins and lustrous glossy finish. arresting, slim-line look of each item will lend a polished, flamboyance to the best dressed man’s wardrobe no matter what he sports - be it casuals, denim, leather, a business suit or black tie. The business card holder has four pockets inside plus an outer back pocket. A horizontally designed wallet is complete with six pockets for credit cards and two deeper compartments for bank notes while another pocket conceals a removable case with slim pockets for business and credit cards. Maximizing its spaciousness, the vertical design of the oblong coat wallet incorporates 14 credit card pockets, two deep compartments for bank notes, an additional two pockets and a striking, spacious zipped pocket. The Notebook is the thinking man’s ultimate travel accessory and, inside, features nine credit card pockets, a writing instrument loop and a refillable pad. It is divided into two sections: “Notes” with ruled, gilt-edged featherweight paper with a feint illustration of a fountain pen is for writing and “Sketches” featuring gilt-edged featherweight paper highlighted with the rendering of a mountain. This light etching - like the soft gold-plated mother-of-pearl star emblem delicately embossing the Meisterstück Atelier accessories - honors the awe-inspiring range of Europe’s highest mountain - the Mont Blanc massif after which Montblanc is named. Such subtle touches symbolize the virtuosity of Montblanc’s craftsmanship as well as its commitment to producing luxury of the highest standard.